My #Runfitters often ask if alcohol impacts their fitness goals. The answer is yes - 1,000 times - YES! Take it from a Certified Personal Trainer & Nutrition Coach: booze don’t burn! At least, certainly not the same way fats & proteins do. 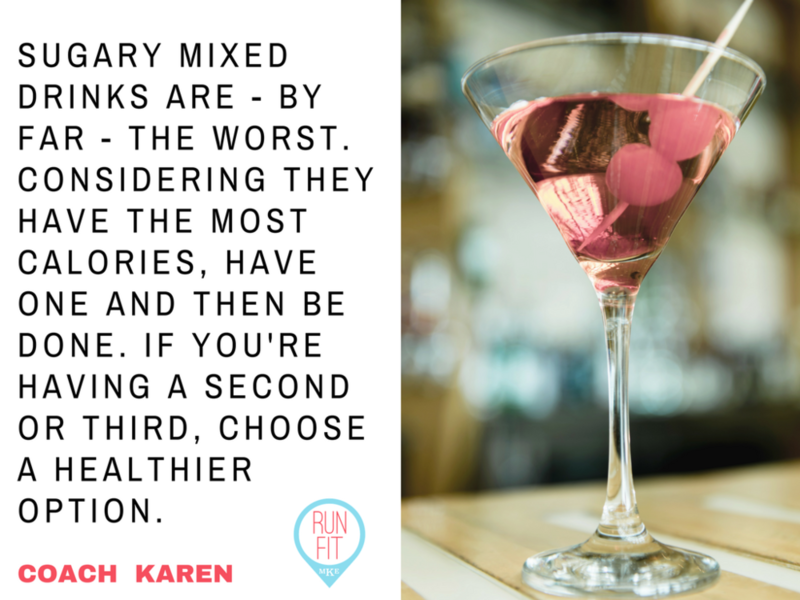 Read on to learn the truth about alcohol and how it differs for men and women, check out some lower calorie substitutes, and hear about my personal beverage choices. If you want to dive deep into the truth about alcohol, I've got two incredible resources for you. First, you'll want to watch the 2016 Netflix documentary: The Truth About Alcohol. This hour-long documentary lays out the scientific risks - and benefits - of drinking alcohol. Unfortunately, there's no discovery for a hangover cure, but there's plenty of information on how alcohol relates to sleep, fitness, mental clarity, energy, and more. Check it out. Another fantastic resource comes from My Fitness Pal. As most of my clients know, I’m a big fan of this app. It helps me and many of my clients track all food and beverages. I also appreciate their weekly blogs and articles, like this one entitled: The Truth About Alcohol. It's a quick read and offers some excellent tips on moderation, lower calorie substitutes, and the hard truth about what alcohol can do to our body if we overuse it. "Women have less of an enzyme that breaks down alcohol, which is known as alcohol dehydrogenase (ADH). They also tend to have less muscle mass. Male or female, if one is actively trying to lose or maintain weight, I recommend paying attention to the following consumption suggestions from the Centers for Disease Control and Prevention:"
What Are my best beverage Options? Yes, I am a Certified Personal Trainer and Nutrition Coach. I know the good, the bad, and the ugly of booze when it comes to health and fitness. I also enjoy a beverage or two. For those who know me best, you know that I'm huge Green Bay Packer fan. When I'm tailgating at Lambeau with friends and family, light beer is my best option. On a weekend, I like to pour a glass of red wine. I try to check myself at one, five-ounce pour (although, that is not always how it works out). I am well aware that more than one glass results in snacking as the alcohol reduces my willpower. It also clouds my thoughts on what's most important to me: my racing goals, overall fitness, and mental well-being! If wine isn't your thing, consider one of the lower calorie options below. For all other Wine-O's out there, check out this resource from the Washington Post - it offers excellent information on wine consumption. If wine isn't your thing and you know you need to start making better beverage choices, there are a number of lower calorie substitutes. Seeking something sweet? Try the Chocolate Cherry Sparkler Recipe, the Mardi Gras Blackberry Basil Margarita, or the TouchDown Tequila Punch. Your best list of lower calorie substitutes, however, can be found in this article: 11 Low-Calorie Alcoholic Beverages. Print it off. Have this on hand so you can plan ahead, especially if you've got fitness and nutrition goals. Looking for someone to hold you accountable? Let me be your Certified Personal Trainer or Nutrition Coach. Contact me today.